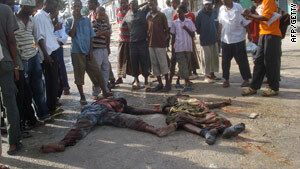 Residents of Mogadishu on Thursday gather around the bodies of two army soldiers killed in clashes with Islamists. (CNN) -- As many as 200 foreign fighters affiliated with al Qaeda may now be hiding in southern Somalia, according to the latest assessments by the U.S. military and intelligence community. Two U.S. military officials confirmed the estimate to CNN, emphasizing it is only an estimate because of the lack of direct intelligence information from the ground. It comes as a senior U.S. official separately confirmed to CNN that updated plans have been put into place for U.S. special operations forces to conduct operations against al Qaeda personnel in Somalia, if targets can be identified and located. All three officials declined to be identified because the information involves intelligence matters. The United States believes the foreign fighters include Afghans, Iraqis, Pakistanis, Saudis, and Yemenis as well as nationals from several African countries, the officials said. It is believed many of these fighters have been part of the longstanding pipeline of fighters that operated in Afghanistan and Iraq and has now been diverted to Somalia, they said. The estimate of 200 fighters does not include an unknown number of ethnic Somalis who are believed to have traveled to Somalia from Europe, the United States and other African countries, they said. In assessing the threat posed by the presence of foreign fighters, one of the U.S. military officials said the most dangerous are perhaps as many as two dozen "subject matter experts" from Afghanistan, Pakistan, Iraq, and Saudi Arabia who are teaching bomb-making and other small arms tactics in camps across southern Somalia. The balance of the foreign fighters is believed to be operating with the Al-Shabaab organization, an al Qaeda affiliate group in Somalia that is fighting the government and African Union peacekeepers in an effort to take control of the country. One official said Somalia is now "the ultimate safe haven." The official added that the United States must operate on the assumption that the core group of foreign fighters are training others to conduct attacks against western targets in East Africa, as well as training individuals to attack targets in the United States. "They have goals beyond the Somalia border," one official said. The United States has observed a number of ad hoc training camps in southern Somalia, the officials said. Generally, they operate for no more than three months before fighters move to other locations because they know they are likely to be observed by U.S. intelligence satellites or reconnaissance drones flying overhead, officials said. Fighters are using existing areas like old army camps, buildings, and even cemeteries to disguise the real purpose of their activities, the officials said. The top al Qaeda operative still being sought in Somalia is Fazul Abdullah Mohammed, long wanted for his alleged role in the 1998 bombings of U.S. embassies in Kenya and Tanzania. He is believed to be moving between the remote border regions of Somalia and Kenya, the officials said. In September 2009, U.S. commandos killed Saleh Ali Saleh Nabhan in a helicopter attack on his vehicle convoy after hunting him for years. Nabhan was seen as perhaps a key leader of al Qaeda operations in East Africa and, according to U.S. officials, it is not clear who, if anyone, has taken his place.